I have a weakness, and its name is pumpkin. Not even kidding, the pumpkin craze has kicked in. I suddenly want pumpkin everything- pancakes, muffins, bread, oatmeal… you name it, it needs pumpkin. Aldi had better watch out, because I’m about to stock up on canned pumpkin. 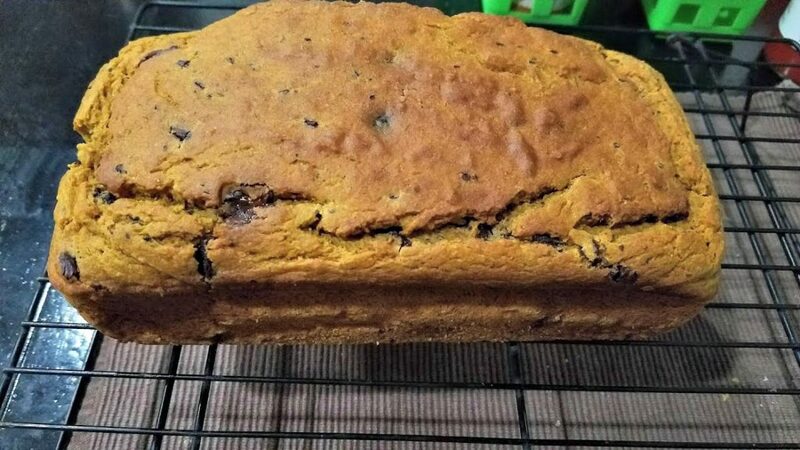 One of the worst (best) offenders right now is this Pumpkin Chocolate Chip Bread. I had intentions of freezing it, but let’s be honest- not all of it made it into the freezer. 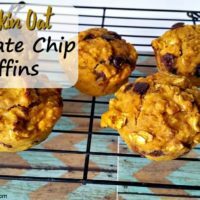 If it has pumpkin and chocolate chips, it’s for me. And it’s pretty healthy, too! This bread uses mostly white whole wheat flour, and is sweetened with maple syrup. And it has dark chocolate chips. Dark chocolate is healthy, right? Making sweet breads is pretty easy. First, combine all the wet ingredients in a large bowl. This recipe called for a 1/2 cup of oil, but I used half oil and half applesauce and it still turned out fine. Then combine the dry ingredients in a second bowl and add them to the wet ingredients. Stir in the chocolate chips (I chopped mine up to make them disperse more in the bread). Pour the mixture into a greased 8×4 pan and bake for about 55 minutes. What you get is perfection. 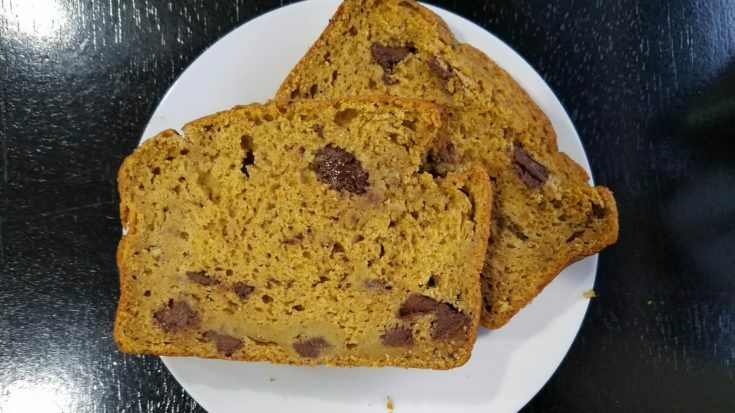 I’ve been known to eat pumpkin bread for breakfast, too. Add some butter or cream cheese (or PUMPKIN cream cheese!) to make it even more delicious. 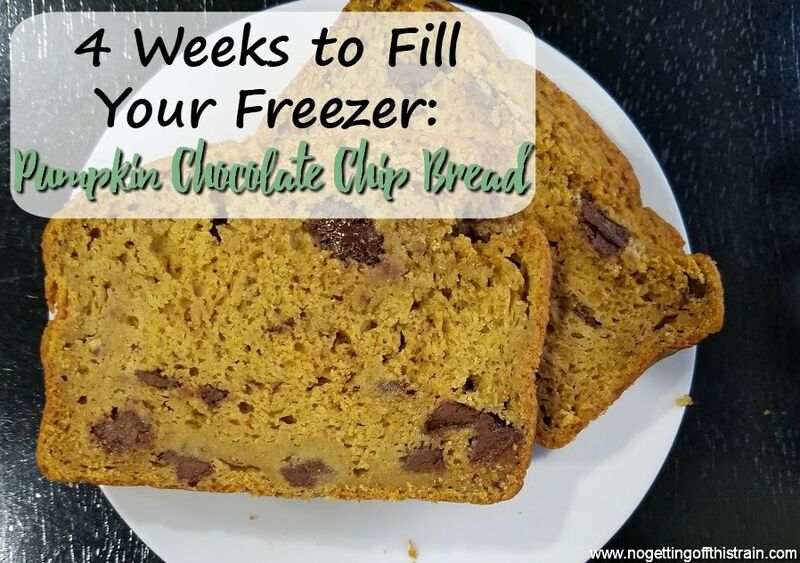 If any of this manages to make it into the freezer, just put the slices on a cookie sheet lined with parchment paper beforehand. Then place them in a gallon-sized freezer bag, and they’ll keep pretty well! 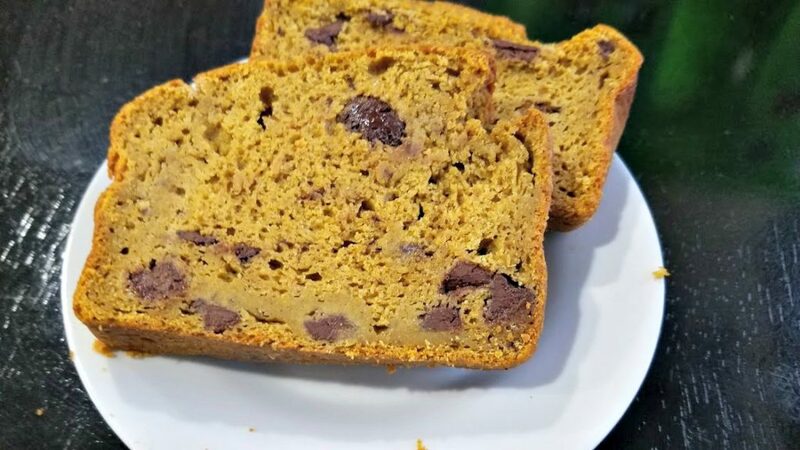 This Pumpkin Chocolate Chip Bread is the perfect Fall treat! It's full of healthy ingredients, freezer friendly, and good for breakfast or snacks! In a medium bowl, mix together the flours, pumpkin pie spice, baking powder, baking soda, and salt. 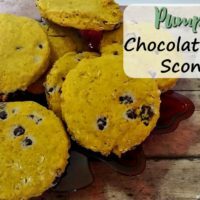 In a large bowl, mix together the eggs, pumpkin puree, oil/applesauce, maple syrup, vanilla extract, and chocolate chips. Add the dry ingredients to the wet and stir until just combined. Gently stir in the chocolate chips. Pour into a greased 8x4 loaf pan and bake for 55 minutes until a toothpick comes out clean. Let the loaf cool for about 30 minutes before transferring to a cooling rack to cool completely. Recipe adapted from Healthy Seasonal Recipes. To freeze, slice the bread into ten slices. 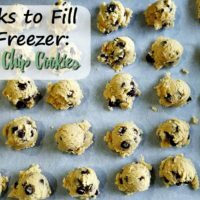 Place on a cookie sheet lined with parchment paper and put in the freezer. 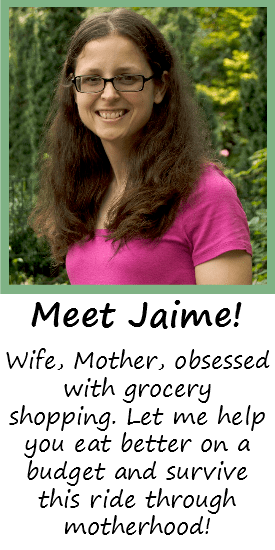 Once frozen, transfer to a gallon-sized freezer bag.